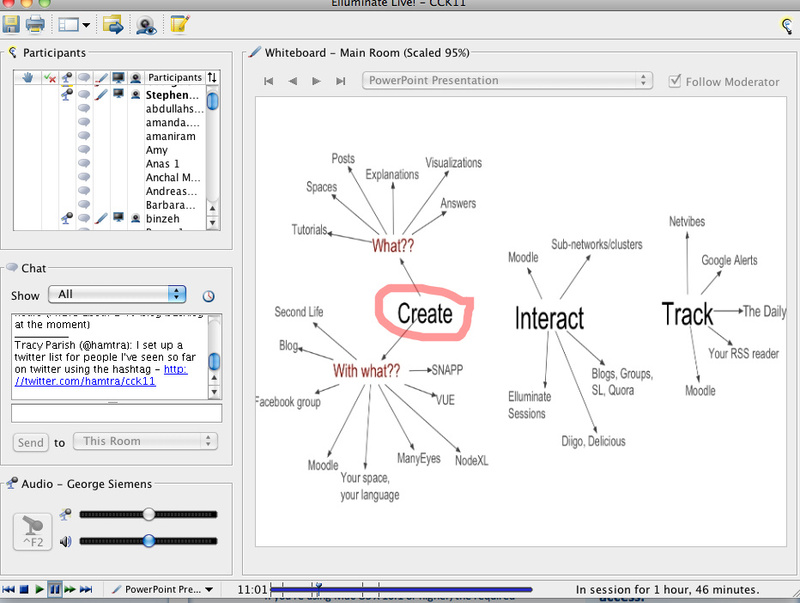 getting caught up on the elluminate recording – what an amazing technology – the chat concurrent with the lecture and the whiteboard. i’ve been working for the last few years on this idea of networks of support, and so it interests me to hear about this flow of roles from learner to teacher, and back again, into aggregated groups of similarly interested peers. in the work i’ve been doing one of the areas of interest has been reciprocity – how important is it to “give back” and how does it happen (in my work, with people with disabilities perceived as not having an abundance of shareable strengths). so i’m delighted with all these people creating different kinds of diagrams, notes, narratives and postings and sharing them with everyone else. George: talking about duplication and how it happens in traditional curriculum and teaching… lovely. so there’s this singular co-learning / growing opportunities that smaller groups and individuals can pursue rather than being one of 30 (or 150) moving in a paced scaffolding. learning through immersion, which is a kind of mentorship / apprentriceship… someone in a different discussion yesterday was saying that the leaders around us don’t have the time or energy to focus on individual young people and mentor them: this idea of a MOOC might be one way to do that.